Step 7: Straws in Spaaace! 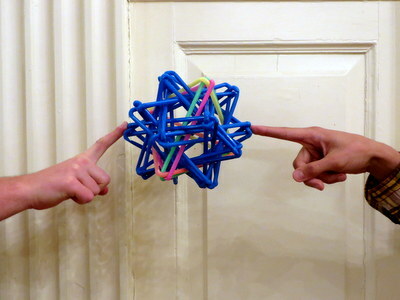 … three-dimensional space, to be precise. Now that the scaffold is complete, let’s use it! 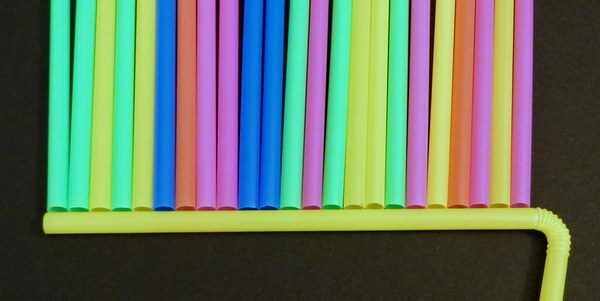 Find your straws; today we’ll use just one of the five colors. Make sure they are already cut or creased as described in Step 1 few days ago. Insert the long straw end at an arrow, and follow the dotted line to the exit. 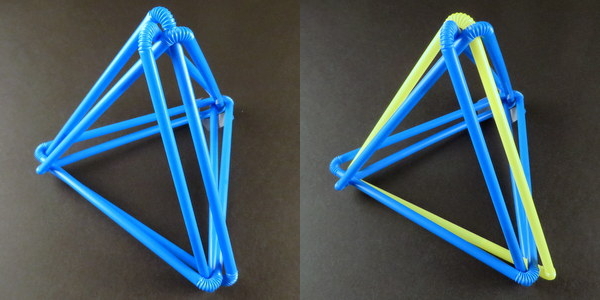 Tomorrow we’ll close up the corners to finish our first tetrahedron! Take five of your finished scaffold units and lay them out in a star like this. And that’s the finished scaffold! Great job! Oh, the Places You(r Straws Thingy)’ll Go! OK! 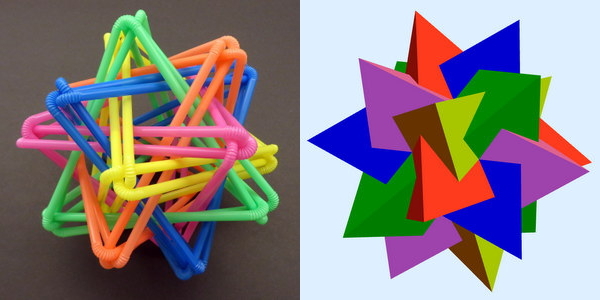 We’ve explored the geometry of Straws Thingy a bit, and we’ll do more of this later. 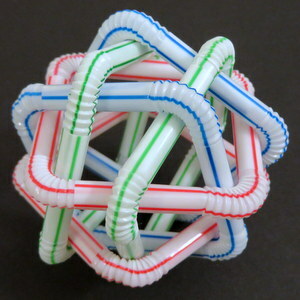 But I think the rest of our mathematical discussion will be much more engaging with a Straws Thingy of your own in your hands! 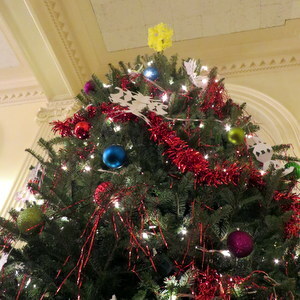 Or crowning your Christmas tree! So let’s start talking about how you can make your own, step by careful step. What’ll you do with yours?! The tubes are inflating (or equivalently, shortening) while pushing away from each other. 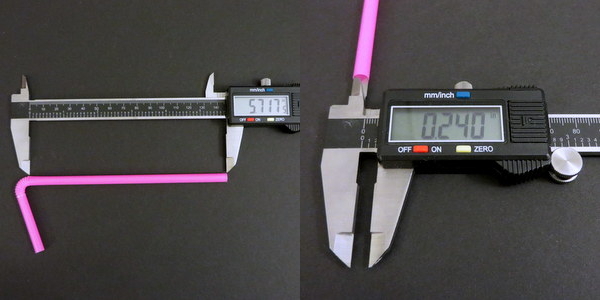 When they can’t inflate(shrink) any more, we’ve reached the ideal, tight packing. 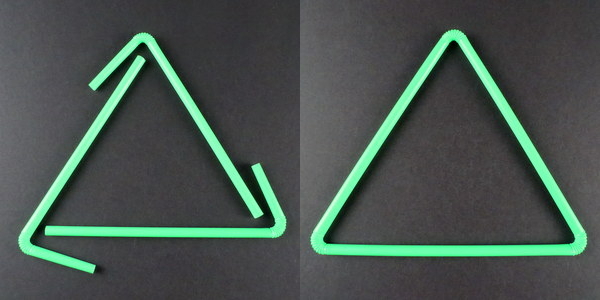 The 27.43 refers to the edge length of the “axial” equilateral triangle, whereas the straws “shortcut” these corners via flexy bits. Of course, the exact shortcut dimensions vary from brand to brand, which further explains why I didn’t offer more precision to yesterday’s 23-or-24 measurement. OK! 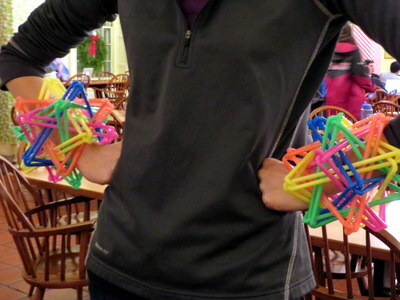 It’s time to switch focus away from discussing Straws Thingy‘s geometry and toward learning, step by step, how to make your own! So go out, find those straws, and get ready for some excitement! 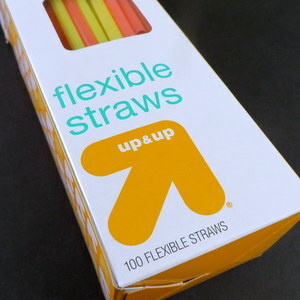 Two days ago, I recommended Target’s up&up brand of flexible straws. Why so specific? Is Target sponsoring these posts? In a word: no. (Hint hint, Target! =D) So why these in particular? 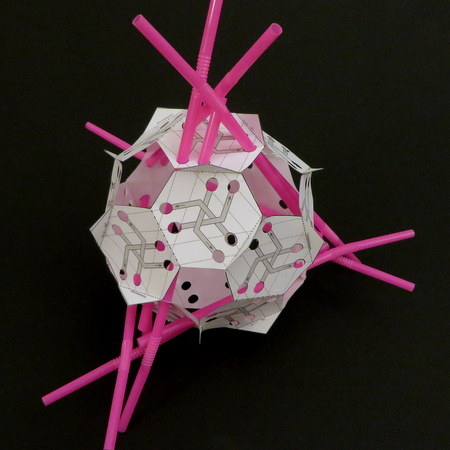 For this model, the size of the straws is critical—specifically, the length-to-diameter ratio. 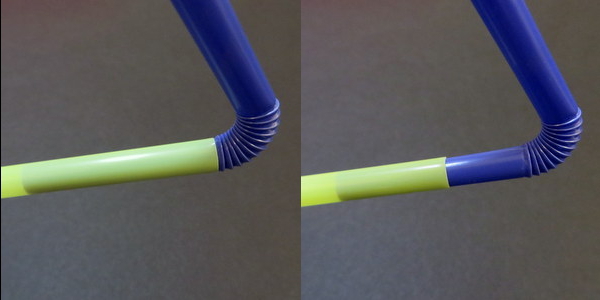 If the straws you use are too long/skinny (like the ones below from Market Basket), the finished model turns out wobbly and unsteady, as if it (appropriately!) drank a bit too much. 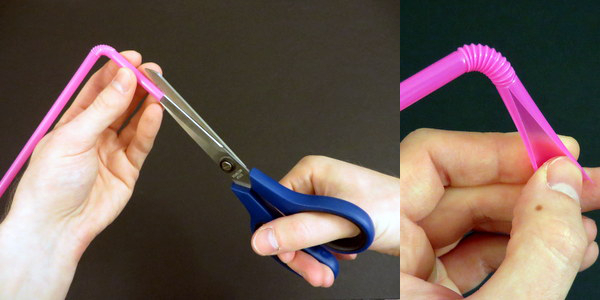 On the other hand, use straws that are too short/fat and they simply can’t squeeze past each other. 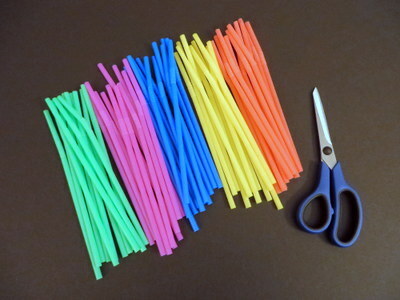 If you find those perfect Goldilocks straws—not too long, not too short, but just right—they keep Straws Thingy perfectly snug and sturdy. 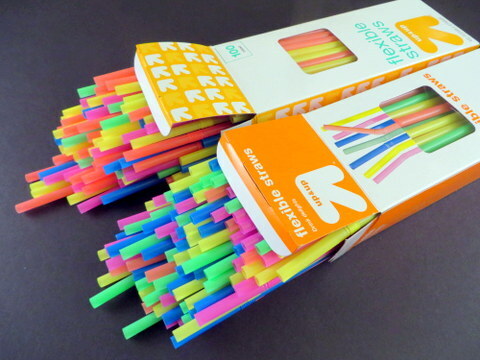 And in this regard, Target’s up&up straws hit a bulls-eye. OK, so what is this shape? As a first approximation, Straws Thingy is simply the Compound of Five Tetrahedra, a favorite among origami folders thanks to Tom Hull’s popular and supremely elegant design. 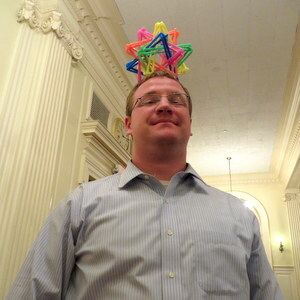 Robert Lang describes this shape as a “polypolyhedron” (specifically, it is the mirror image of Polypolyhedron 44), and he originally classified all such shapes (there are 54) for origami—his folding of this particular polypolyhedron, a model he named K2, is especially stunning and took a full day to assemble! 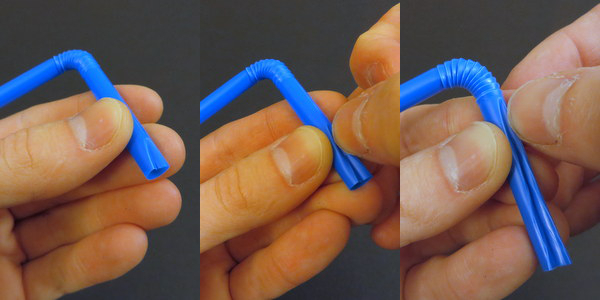 After much deliberation and Simple English Wikipedia browsing, I decided to call it Straws Thingy. So what is it? How does it work? What is it good for? Why does it induce vertigo if you stare at it too long? And how can you make one yourself? I’ll cover all this and more in the coming weeks. (Except for that 4th question. You might want to ask your doctor about that one). And yes, I’m confident that you can indeed make your own. 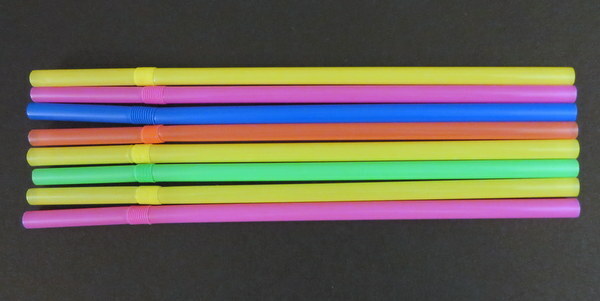 To start, I suggest heading to Target and picking up a box of up&up 5-color flexible straws, making sure you have at least 12 of each color. We must settle one more question to round out our elliptical arc: Why does light, when shot from one focus of an ellipse-shaped mirrored room, reflect back to the other focus? To answer this question, we’ll need a Fact, a Formalism, and a Fairy Tale. Recall that, in the previous post, we saw that ellipses can be described by distances: Any ellipse has two focus points F1 and F2 so that the total length of broken path F1XF2 is the same for every point X on the ellipse; let d be this common total distance. In fact, more is true: the length of F1XF2 is smaller than d if X is inside the ellipse, and larger than d if X is outside. Left: The distance of the broken path is greater, equal, or less than d depending on whether the central vertex is outside, on, or inside the ellipse. Right: A proof of the “outside” case. To prove this fairly intuitive fact, we’ll use the “straight line principle”: the shortest distance between two points is a straight line. Indeed, when X is outside the ellipse (see right diagram above), straight-line path YF2 is shorter than the path YXF2 that detours through X, and so \(\)d = F_1 Y F_2 < F_1 Y X F_2[/latex]. See if you can fill in the case where X is inside the ellipse. Recall that when light bounces off a straight mirror, the angle of incidence equals the angle of reflection. But here we’re discussing light bouncing off an ellipse, which is decidedly not straight. So we need to formally describe how light reflects off curved mirrors. Reflection off of a curved mirror behaves like reflection off of the tangent line. If we zoom into where the incoming light ray strikes a curved mirror (illustrated above), the mirror closely resembles a straight line, specifically its tangent line. This suggests that the light should behave as if it is reflecting off of this line, with equal angles as marked. This is indeed the rule governing ideal reflections on curved mirrors: the angles of incidence and reflection, as measured from the tangent line, should be equal. The last ingredient involves Little Red Riding Hood and her thirsty grandmother. Red is delivering cake and wine from her mother (point M) to her grandmother (point G), but she must first fill a bucket of water at the nearby stream S, which is conveniently shaped like a straight line. She was warned by her Brothers to watch out for a big bad wolf, so she must minimize her total walking distance. Where on the stream should she fill her bucket to minimize this distance? Left: Paths from M to S to G transform into paths from M’ to G, the shortest of which is straight. 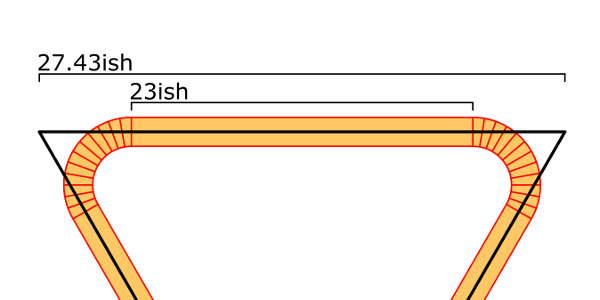 Right: This straight path behaves like a mirror. To answer this, imagine reflecting the first leg of Red’s journey across line S, so her path from M to S to G gets reflected to a path from M’ to G. The reverse may be done as well: any path from M’ to G turns into a path from M to G that stops somewhere along S. So we just need to find the shortest path from M’ to G. But this is easy: it’s just the straight path M’G. So Red’s shortest path from M to S to G is the one that stops at Z. 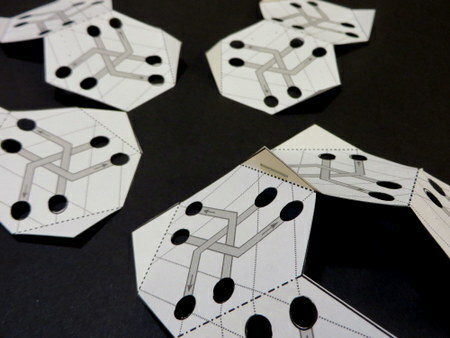 Notice that this shortest path is the one with equal angles as marked. This means Red’s best strategy is to pretend the stream is a mirror and to follow the light ray that bounces directly to grandma’s house. This neatly exemplifies Fermat’s principle, which says that light tends to follow the fastest routes. With these pieces in place, we can finish today’s question in a flash. Let’s say light from focus F1 hits an ellipse at point X, as illustrated below. Why does this ray bounce off the ellipse toward F2? If we draw the tangent line L at point X, by The Formalism above, this question is equivalent to: why does the light ray bounce off of line L toward F2? Why are the two marked angles equal? Because the white path solves Red’s Fairy Tale problem. Let’s reimagine this Grimm scenario by thinking of F1 as Red’s mother’s house, F2 as grandma’s house, and L as the stream. I claim F1XF2 is the shortest path for Red to take. Why? If Y is any other point on line L, then Y is outside the ellipse, so by The Fact above, F1YF2 has distance longer than d. So F1XF2 is indeed the shortest. But by The Fairy Tale, we know that this shortest route behaves like light bouncing off of line L, i.e., the marked angles are indeed equal. So we’re done!